"I got a text from their manager, who said; “Do you want to play for the Black Star Riders?” and I was like; “Yes! Send me their stuff!” I fell in love with their music, learned it within an hour, and send a video." - Chad Szeliga. 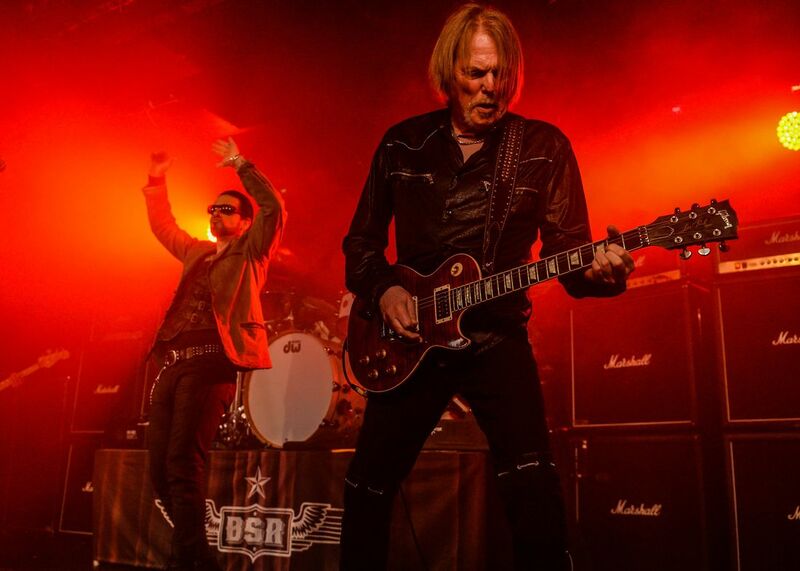 It’s been a particularly busy time of late in Black Star Riders. Recently re-signing with Nuclear Blast, they started off the year with the release of ‘Heavy Fire’, only to go through their second line-up change following the departure of drummer Jimmy De Grasso. Introducing former Breaking Benjamin and Black Label Society sticks man Chad Szeliga just last month, we caught up with the newest BSR recruit along with ever-present guitarist Damon Johnson at the Metal Hammer Golden Gods Awards in London, for a chat about changes, and what lies ahead. Dancing with the wrong girl; Eamon O’Neill. ​Welcome to the Golden Gods, guys. Chad Szeliga: Thank you having us. 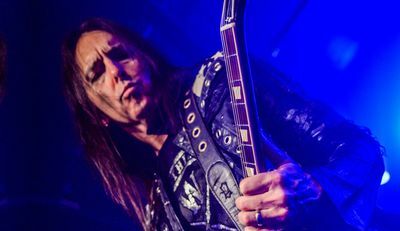 Damon Johnson: Man, it’s good to be here. It’s kind of an accident. We had no idea this was going off, and I started looking around on the internet for something to do on a Monday night in London, and it was either this or Take That. I had tickets to Take That actually, but I gave them away to my grandmother, and she was elated. It’s a particular welcome to you Chad, as the new drummer for Black Star Riders. CS: I’ve been in the band since May 19th, and we did our first gig at the end of May. DJ: Yeah, we done a run of dates in Germany, and those were great. Right now we’re straight into some festival dates, but what better to do on your time off than come into London and try to squeeze in a round of golf with the legendary Scott Gorham. Did you guys know Chad before he joined the band? So Black Star Riders approached you Chad? 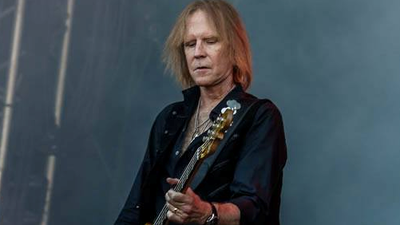 CS: Actually, I got a text from Adam, their manager, who said; “What are you doing?” I said; “Ah, absolutely nothing!” He said; “Well, do you want to play for the Black Star Riders?” I kind of knew a little bit about them, and I was like; “Yes! Send me their stuff!” And I fell in love with their music, learned it within an hour, and send a video. Was that a difficult change to make, given that ‘Heavy Fire’ had just been released? DJ: Yeah, I mean, any of us would be lying to say that it’s not difficult, and it was difficult for Jimmy – who is here, by the way. We were just hanging out with Jimmy, and it was great to see him. Those transitions are always a challenge, if for no other reason than there’s a comfort zone; we’re very comfortable playing together, writing together and recording together. But Chad has been so respectful of that process. He didn’t come in with any pretence; his whole vibe was; “Hey guys, I want to make this as seamless as possible – this is more of an adjustment for you than it is for me”. And as soon as he said that, I was like; “Wow, man”. You couldn’t hope for a better attitude about that aspect of it. How did you feel Chad as the intro tape was rolling on that first gig? CS: I heard the air raids and I wanted to run for shelter! DJ: They don’t have those in Pennsylvania! In between BSR shows there’s a couple of Warwick Johnson acoustic gigs coming up. DJ: Yeah, it’s always a pleasure to perform with Ricky as Warwick Johnson. It was just one of those things; it worked out, we had a little hole in the calendar, and that’s how the whole thing began in the first place, four years ago. It’s a good night, and I love to perform with Ricky in that format because I don’t have to sing everything like I do when I’m doing solo things at home, and he doesn’t have to play all the guitar, with me up there; he can take his hands off the wheel. I’m excited for Chad to see that. I hope he can see us do that sometime. 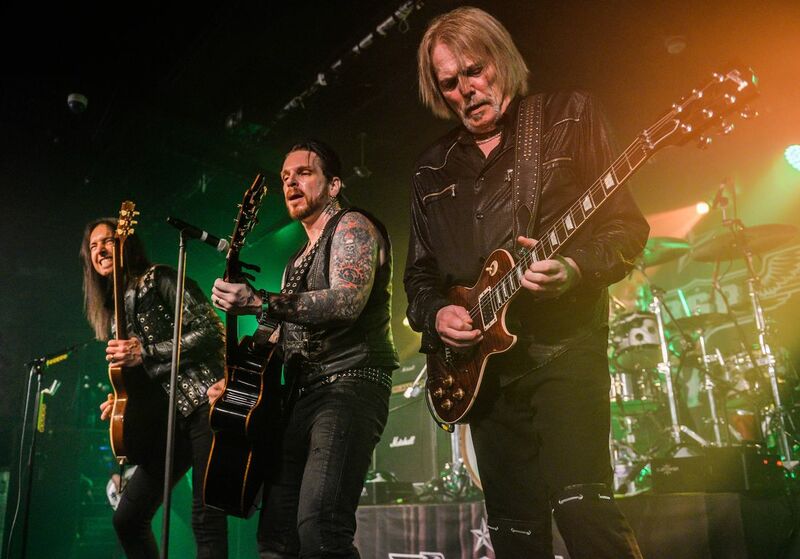 You and Ricky write the bulk of Black Star Riders’ material; is it on acoustic that they start out life? DJ: Yeah, that’s certainly where a lot of things start. No surprise to anyone, we’ve been out for a month now, and we’ve already got four or five new things cooking. He’ll play a riff, or have some lyrics, or I’ll go; “I’ve got this idea for a song”, and I just think that we’re fortunate that way. Obviously, that’s the explanation of how we could put out three pretty solid records in just four years, so the work ethic and the song writing has a lot to do with it. Are you looking forward to perhaps getting a little time off after such an intensive working period? DJ: Yeah, you know, we just want to always try and make good decisions about our time. You don’t want to overplay, and you don’t want to try to shove it down people’s throats too hard. We’re fortunate that we have countries like England, Scotland, Ireland, where there’s a real passion for what we’re doing, and we’re grateful for that. In some of the other countries we’re having to educate people, so it’s more of a grind, and it’s not always easy. So, I guess that’s sort of a long winded answer. Yeah, it would be cool to take a little bit of a break, but at the same time, we want to take care of the momentum that we’ve built. DJ: We would probably give up a digit on one hand, each of us, if we could do a run of dates on the States. We want that to happen so desperately. The US is in a quagmire with rock and roll right now, man, and I can’t really explain it or put a finger on it. There’s definitely people passionate about coming to see us, but unfortunately, it’s a ginormous country, and they’re all spread out. 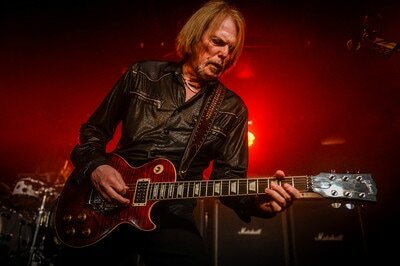 We should just have a Black Star Riders festival in Lincoln, Nebraska, and everyone come into that! But our fingers are crossed, man. We want to get on a package tour in the States, similar to what we did when Lizzy played with Judas Priest and Black Label Society six years ago. That was productive for us, if we could do that same thing again. Finally, will you be trying to get the boys to re-introduce a few more Thin Lizzy numbers, Chad? CS: I’m still learning all these songs, so I’m down for anything, man. The concentration is obviously the Black Star Riders, but the whole tradition is the Thin Lizzy, so we’ll do like, on song, two songs here and there, and just focus on the Black Star Riders. That’s the goal. 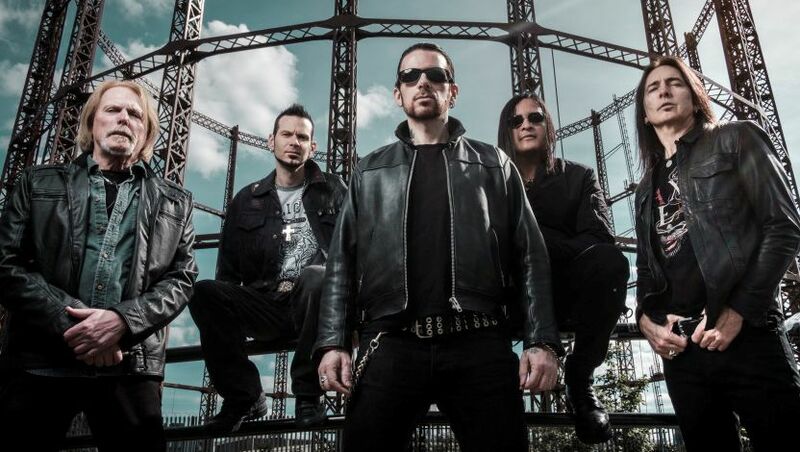 Black Star Riders Play Ramblin' Man Fair in Maidstone, Kent on 29th July. For tickets and further information, visit the official Ramblin' Man Fair site.